In 1987, at the height of the so-called bubble era, when land and stock prices were on a bender, the Diet passed the Law for the Development of Comprehensive Resort Areas, whose idea was to make the development of leisure facilities a national project. Developers and local governments were given financial incentives, and property laws were relaxed so that more holiday-oriented projects could be carried out. One of the outcomes of the law was the invention of the “resort mansion,” condominium complexes that were built in outlying areas where city folk could spend their vacations. Many of these complexes were built near ski resorts because the late 1980s also saw a huge increase in winter sports activities. According to a recent report on TBS News, 18.6 million Japanese people took up skiing as a hobby in the late 80s. Today, the ski demographic has dwindled to an estimated 7 million enthusiasts, and there are a lot of condominiums vacant as a result. The bulk of these residences are very small–less than 30 square meters–which means they probably hold little interest to anyone who doesn’t ski. Still, the drop in value is quite dramatic. One 28-square-meter unit that was built in 1989 and originally sold for ¥14 million was recently auctioned for a mere ¥40,000. In fact, that particular apartment was bought by the tenants association of the building that contained it. The association was worried that, at that price, anybody could buy it, and thus there was the possibility that the person who bought it would not be able to keep up with the monthly management fees and pay the annual property taxes. The association plans to try and sell it at a higher price. The reason prices have dropped so far is that the people who own the condos no longer really use them any more. There are various reasons. Besides being cramped, the condos are of generally poor quality, and, for whatever reason, the owners just got tired of making the trip. Most of the foreclosures have nothing to do with mortgages. Instead, the local government or building management companies have seized the properties because of non-payment of contract management fees and property taxes. Another 28-square-meter condo that originally sold in 1989 for ¥14 million is going for ¥310,000, but the buyer will also have to assume ¥17,000-a-month payments for management and pay ¥38,500 a year in property taxes. For a 50-square-meter apartment that originally sold for ¥40 million and is now worth ¥400,000, the management fee is ¥27,000 a month and the property tax ¥97,000. In some cases, people who buy used resort condos are required to cover the management fees that the previous owners didn’t pay before they can move in, thus making them that much more difficult to sell. According to the town government, 40 percent of the resort owners (condos and besso, or second homes) in Yuzawa haven’t paid property taxes for some years, and 80 percent of these scofflaws have their prime residence in Tokyo. The problem has become so serious that Yuzawa has set up a special section in its Tokyo representative office to track down these owners and make them cough up what they owe. 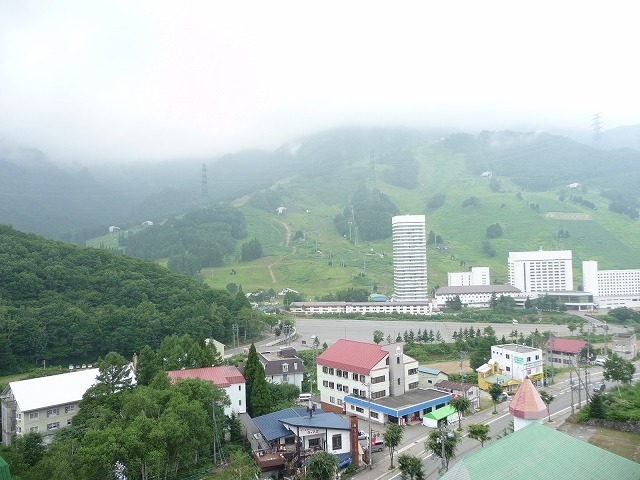 I think Yuzawa had plenty of potential as a resort due to its natural features, climate, location, etc. Sadly, the type of development there has made it a dull and uninspiring place. The boxy concrete buildings are poorly conceived. These mansions (doubtless lacking insulation and central heating) mar the otherwise lovely landscape, and seem more akin to an factory bedtown than a resort. Further, the town seems to shut down at 6 p.m, even during the peak of the ski season. Apres-ski? Forget it. Most places I’ve stayed aren’t pedestrian friendly. Lots of narrow roads with no sidewalks and with big industrial trucks roaring past.